Want an easy way to get some great deals on Gino’s deep dish pizza? Sign up for our new rewards card! We’re hooking up our loyal customers with $5 off their next order just for signing up, and you’ll continue to earn points on every purchase at Gino’s as long as you use your card! For every $1 spent get a point, and get an automatic $5 credit once you reach 100 points! We’ll also be sharing special deals with our rewards members not available to the public, free gifts on your birthday, and who knows what else. Don’t feel like adding another card to your wallet? No problem! Just visit ginoseast.com/rewards to register, and you’ll be able to use your phone number to earn rewards on every visit. 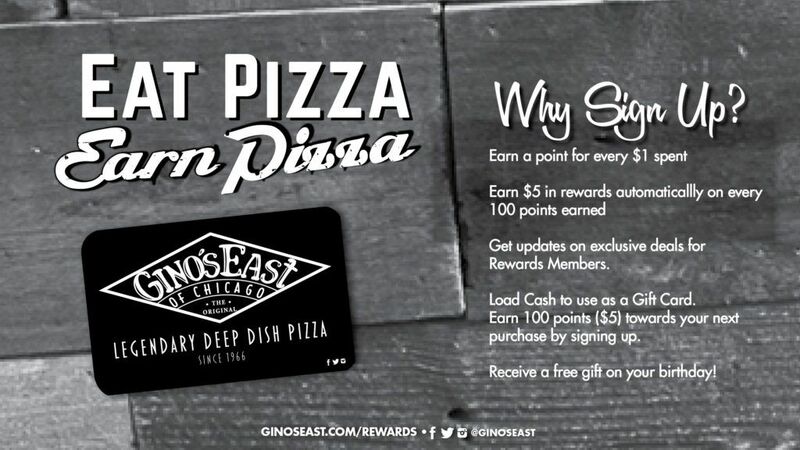 For now, you’ll only be able to earn points at Gino’s East locations in the US. We’re working hard to integrate the program for our online store, and we hope to have that up and running by the end of the year.